While no country is perfect, the Central American nation of Costa Rica is probably not far off. Part of the isthmus which links North and South America, Costa Rica is a small, rugged piece of paradise, consisting largely of rainforest with golden beaches lapped by either the Pacific or the Caribbean. 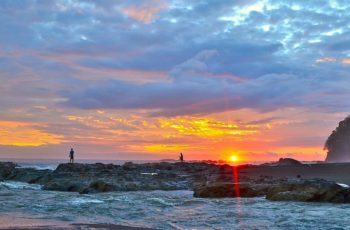 Costa Rica – doubtless inspired by its natural beauty and outrageous biodiversity – has successfully positioned itself as a prime ecotourism destination. But this is no passing fad – preserving the environment is a way of life here. 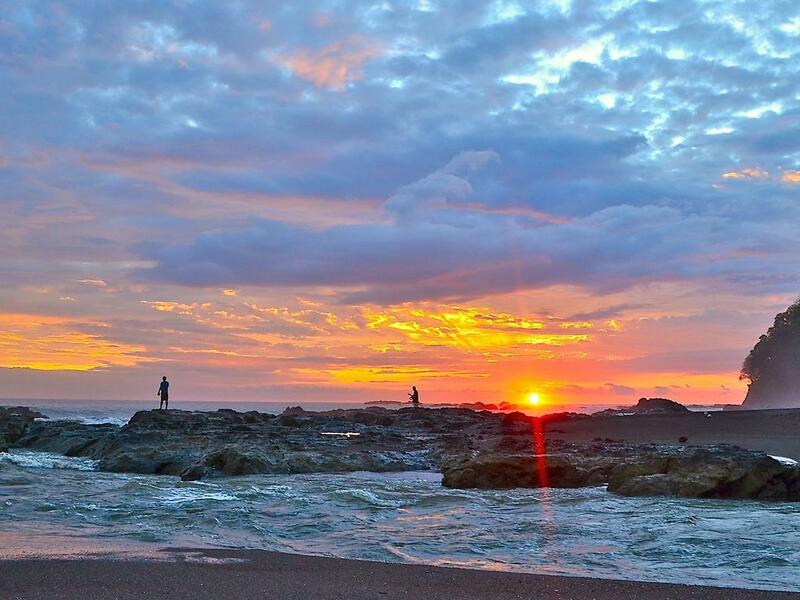 Costa Ricans wish each other ‘Pura vida’ – a pure life – when they meet. 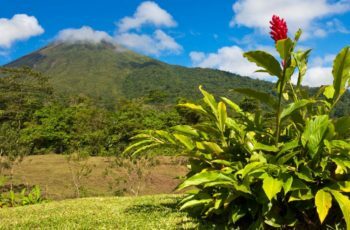 Costa Rica will be carbon neutral by 2021, and it’s regularly ranked as one of the happiest countries in the world. 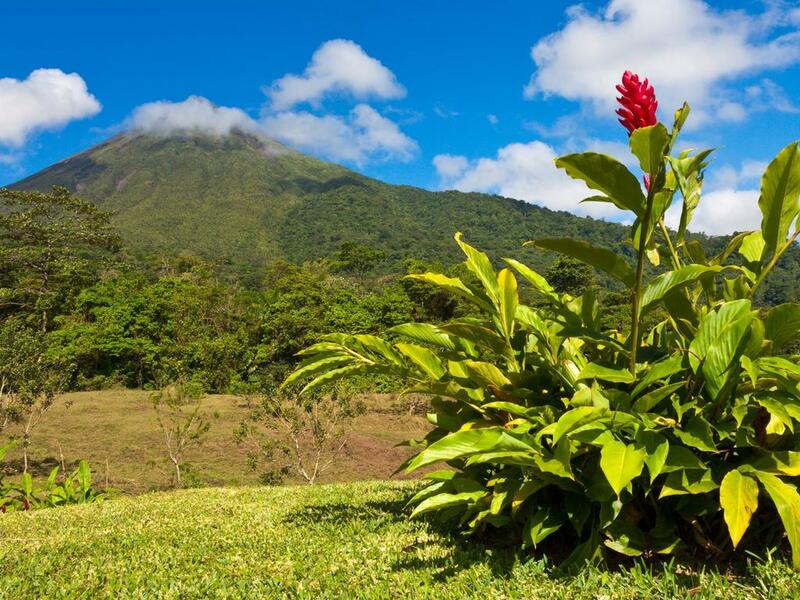 It’s easy to see why: lush emerald rainforests cloak rolling hills and impressive volcanoes, while over fifty species of bejeweled hummingbirds flit between the tropical blooms. There are turquoise rivers and beaches that come alive with turtle hatchlings heading for the ocean. You’ll be charmed by the sloths – who can perhaps teach us all something about the pace of life – and puzzled by mysterious stone spheres. They were obviously made by people, but no one knows whom. Costa Rica offers ample opportunities to simply soak it all in, but you can also enjoy more active moments. Catch a wave – the surfing on the Nicoya Peninsula is superb – or overcome your vertigo as you fly through the jungle canopy on a zipwire. White water rafting is another option for exploring the interior (try the Turrialba area for excellent thrills and the occasional spill), and after all that excitement, a cocktail whilst watching the sunset could just be in order. The combination of outstanding natural beauty, warm and friendly people, and fascinating wildlife is a winning one. Costa Ricans are justifiably proud of the pristine state of much of their homeland, and have gone to considerable lengths to protect the many different ecosystems contained within this small country. Look out for orchids and colorful quetzals (a type of bird) when you trek through the Monteverde cloud forest – as you pause and look around you, you won’t need much convincing that you’ve found a little piece of heaven on earth. With perfect white sand beaches backed by vibrant rainforest, and thriving coral reefs beneath turquoise seas, Manuel Antonio National Park really does it have all. It’s a picture-perfect destination, but leave off taking your holiday snaps until later and spend some time appreciating the sheer beauty of your surroundings…. Electrical sockets (outlets) in Costa Rica are very similar to the electrical outlets found in the United States and Canada, and if your appliance has a North American plug, it’s possible that you won’t need any adapter at all in order to plug in there. However, there are two potentially very important physical differences that may need to be addressed with an adapter: grounding and/orpolarization. If your plug has one or both, and the socket doesn’t, then the plug may not physically be able to fit into the socket without an adapter. In the case of a North American appliance plug, grounding is accomplished by the third, round pin beneath and below the two vertical blades on the plug. Polarization is accomplished by the left vertical blade being taller than the right, so that the plug can’t be inserted upside down. U.S. and Canadian sockets are required to be both grounded and polarized. But in Central and South America, the Caribbean, Japan and other areas which use U.S. style sockets, grounding and polarization often are not required, and in fact, the majority of sockets in many of these areas do not accept the taller blade and/or the third grounding pin. This will prevent a North American appliance plug from being able to plug into these sockets, if the plug is either grounded or polarized. Electrical sockets (outlets) in Costa Rica (República de Costa Rica) usually supply electricity at between 110 and 120 volts AC. If you’re plugging in a U.S. or Canadian 120 volt appliance, or an appliance that is compatible with multiple voltages, then an adapter is all you need. But travel plug adapters do not change the voltage, so the electricity coming through the adapter will still be the same 110-120 volts the socket is supplying. If your appliance is from another part of the world, and it is built only for 220-240 volt electricity, or a Japanese appliance built for 100 volts, then a travel plug adapter by itself won’t be sufficient. The voltage will have to be changed from 110-120 volts at the socket, to whatever voltage your appliance requires. This is accomplished with a voltage transformer. Costa Rican Colón (CRC; symbol ₡) = 100 céntimos. Notes are in denominations of ₡50,000, 20,000, 10,000, 5,000, 2,000 and 1,000. Coins are in denominations of ₡500, 100, 50, 25, 20, 10 and 5. USdollars are also widely accepted. The import and export of local and foreign currency is limited to US$10,000. Amounts above this must be declared upon arrival. Currency exchange facilities are available at banks and bureaux de change. Some hotels may also change money. Additionally, small stores will allow visitors to pay for goods in US dollars and receive change in colónes. Banking hours: State banks Mon-Fri 09h00-15h00. Private banks Mon-Fri 08h00-16h00. Diners Club, MasterCard and Visa credit cards are all accepted; American Express slightly less so. Many banks will only process MasterCard for cash credits. Cash may be the only form of payment in smaller towns and rural areas but many places will take US dollars, giving change in colónes. ATMs are common throughout the cities and small towns. They will usually accept foreign cards but in some regions only Visa cards are accepted. Occasionally, paying with credit cards may not be possible for technical reasons. Bringing a good supply of US dollars in cash is advised, as many things such as entrance fees to national parks or meals at restaurants, can be paid for with US dollars. Although travellers can avoid additional exchange rate charges by taking traveller’s cheques in US dollars, fewer and fewer businesses in Costa Rica are willing to accept them, and it is better to use the ATM. Mains water is normally heavily chlorinated and, whilst relatively safe to drink, may cause mild abdominal upsets. Drinking water outside main cities and towns may be contaminated and sterilisation is advisable. Bottled water is available and is advised for the duration of the stay, especially for those who have sensitive stomachs. Milk is pasteurised and dairy products are safe for consumption. Local meat, poultry, seafood, fruit and vegetables are generally considered safe to eat. Restaurants in coastal towns and larger cities serve a variety of foods – you’ll find everything from Argentinian steaks to Middle Eastern food. Expect to see Chinese, French, Italian, Mexican and North American joints selling food that can range from satisfactory to sublime. The Caribbean side of the country tends to be more aligned with food on the islands – jerk chicken is a staple, rice and beans (gallo pinto) is more likely to be prepared with coconut milk, and ginger and curry spices feature heavily as ingredients, leading to dishes with a very distinct flavour from their counterparts on the Pacific coast. The Costa Rican diet is fairly healthy with smaller portions than in the US, and low use of dairy or high-fat dishes; fruits and vegetables make up a high proportion of meals, whilst pork, chicken and beef are the meats predominantly available. Seafood is available throughout the country, particularly in coastal regions, with seabass being the most common fish on the menu. In San José, options range from expensive and exemplary gourmet restaurants to cheap sodas (small, simple restaurants) serving local food, including set lunches called casados at bargain prices. In the Central Valley, where the main centres of population are located, the average temperature is 22°C (72°F) and the region enjoys a spring-like climate year round. In the coastal areas, the temperature is much hotter and humid, while the Pacific Northwest can be extremely hot and dry. The rainy season starts in May and finishes in November, although there are distinct regional variations. June and July are the wettest months, particularly on the Caribbean side, but the season can run from May until December. The ‘warm’ dry season is December to May, though temperature differences between summer and winter are slight. March is the height of the dry season, and the humidity is lower at this time, making this a popular time for visitors. SANSA (www.flysansa.com) operates services between San José and provincial towns and tourist resorts, including Tortuguero, Tamarindo, Quepos and Golfito. A bus is provided from the airline offices in San José to the airport. SANSA’s main rival is Nature Air (www.natureair.net), which is considered to have more reliable service and has identical routes. Both use a variety of aircraft carrying up to 35 passengers, but Nature Air’s planes are slightly bigger. A number of companies also provide internal charter flights using small planes. Much of Costa Rica is riddled with atrocious roads, so if you can afford to fly then it will make your life a lot more comfortable. Costa Rican domestic airline Nature Air (www.natureair.com/nature-air-pass.aspx) offers air passes for either a fortnight or a month, allowing unlimited flights in that time for a set price. It’s a good opportunity, given that many roads in Costa Rica are rough or mountainous. Costa Ricans drive on the right side of the road. The quality of the roads in Costa Rica is, for the most part, not great. Stretches of the Pan-American Highway leading to and from the major cities tend to be okay, but the rest is a mix of dust, gravel, potholes and perilously mountainous roads. Be very careful driving – especially if you’re in a hired car and want to get your deposit back – and if you’re a nervous driver then consider public transport instead. You must be over 21 to hire a car, and though an international driver’s license is safest, you are likely to be able to use a full license from your own country. You will need a credit card for the deposit, which will cost at least as much as the car hire but which you will hopefully get back. There are many different car hire companies in Costa Rica, predominantly in San José and at the main airport, but it is advisable to either book a car through a local travel agency or to be exceptionally careful to note and confirm any damage or scratches to the vehicle before you drive off. Also ensure that the vehicle comes with a spare tyre – a decent one! – and a jack, because Costa Rica’s roads are such that you may well need one. A speed limit of 80kph (55mph) is enforced on most highways. However, Costa Ricans are notoriously dangerous drivers who pay little heed to speed limits and traffic regulations. Be careful going through towns, as the speed limit drops. If you speed or drink drive the Costa Rican police can fine you heavily, so it is suggested that you don’t do anything to antagonise them and, if you are pulled over, be extremely nice. Never try and bribe them. Use of seat belts is mandatory. Taxis are numerous and inexpensive in San José. The taxis are coloured red (except those serving the Juan Santamaría International Airport, which are orange). Taxis are usually metered, but few drivers use the meters as they figure they can extract more money from tourists by not doing so. Make sure they put it on and that it hasn’t already been running, or ask your hotel concierge how much a fare should be, and negotiate with the driver to an agreed amount before setting off. Public transport via road in Costa Rica ranges from the large coach companies such as the Tica Bus (www.ticabus.com) and Transnica (506 2223 4242; http://transnica.com), which are comfortable and air-conditioned, to tiny little shuttle buses in the Nicoya Peninsula, where they pack you in and jolt you around for hours. Bus travel, however long and potentially frustrating, is inexpensive and often quite fun. Train lines are now limited to two commuter routes: from Heredia to San José, travelling only at peak times and taking half an hour; and from Pavas via San José and San Pedro to Curridabat, running only hourly in the morning and evening. Lightweight cotton and linen clothing is recommended for most of the year with warmer clothes for cooler evenings. Waterproofing is necessary during the rainy season. Loose-fitting clothing is best. Wear neutral browns and greens for birding and wildlife viewing. Always bring mosquito repellent for both day and night.